If you are looking for ways to start a business in Kentucky, then grab the business opportunity offered by The BBQ Cleaner. We are a BBQ and grill cleaning business looking for people who want to discover their potential to earn money in a very unique way. Basically, you will think that like other businesses, you will need years of experience to be able to operate and manage one. You might also think that we require a huge sum of investment to be able to start this type of business. All of these are not needed to be able to grow your BBQ and grill cleaning business through our help. We do not sell a franchise for this type of business hence there are no royalty fees whatsoever. You will also have plenty of potential customers in Kentucky since we have been receiving service requests in the past from people of the state. The problem is we lack people who will help us operate our business in Kentucky. With your help, we can reach out to these residents. Add to that you can work according to your availability and charge fees depending on the services that you have performed. We are here to help you grow your business. Why Start a BBQ Cleaning Business in Kentucky? Weather is in Your Favor: Kentucky is known for having warm summers and moderately cold winters. This means that residents will take every chance they have grilling food outdoors. You can meet the demands of these people when it comes to grill cleaning services. Growing Number of Potential Customers: Many of the residents in the state have their own grills. The state also hosts its very own BBQ festival. This means you can make money from these potential customers whenever they hire you for your grill cleaning services. Competition is Not Tough: The world of BBQ and grill cleaning services is less competitive compared to other business niches. You can look forward to serving more people because of this. Room for Growth: You can easily grow your business whenever necessary. Hire more staff or add more vehicles to reach out to more people. How Does The BBQ Cleaner Help You Get Started in Kentucky? Our all-in-one package will do you a lot of help to get started. Add to that, we also offer access to our on-going lifetime business support. The BBQ Cleaner will make sure that you will unleash your full earning potential when it comes to grill cleaning services. To date, we already have more than 180 operators nationwide. This makes us an established name in the BBQ and grill cleaning industry. 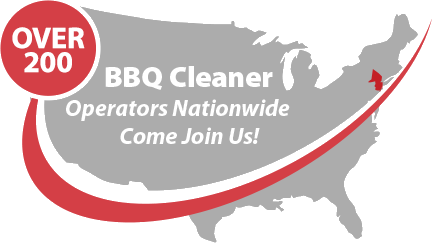 Talk to us today to find out more about this stellar BBQ cleaning business opportunity in Kentucky!